BMW’s groundbreaking 3.0-liter Advanced Diesel engine has again been named one of Ward’s 10 Best Engines. 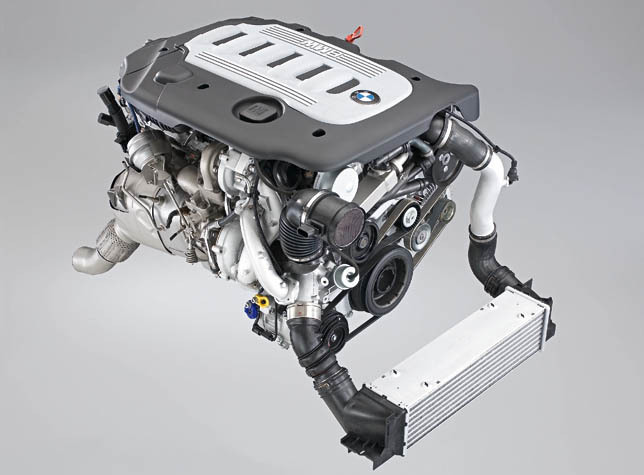 For the 2010 model year and the second year in a row, BMW’s sequential twin-turbo inline-6 diesel engine was elected to the 10 Best Engines list by the Ward’s AutoWorld panel of expert judges. To win a place on the 10 Best Engines list, an engine must score highly in measures of horsepower, torque, refinement, technical relevance, and comparative data. Featuring all-aluminum construction, BMW’s 3.0-liter sequential twin-turbo Advanced Diesel inline-6 offers V-8 performance with four-cylinder fuel efficiency: 265 horsepower and 425 lb-ft of torque. EPA efficiency figures are 23 (city) / 36 (highway) in the 2010 BMW 335d Sedan, which is capable of 0 – 60mph in 6.0 seconds or better. Those figures make the 335d Sedan the fastest diesel-powered passenger car available in the US. It is also the most fuel efficient vehicle BMW has ever sold here. In addition to the 335d Sedan, this BMW Advanced Diesel engine is available in the X5 xDrive35d Sports Activity Vehicle, which is capable of 0 – 60mph in 6.9 seconds and 26 mpg on the highway.